The Inventory adjustment module allows you adjust the items you have in your inventory. This is only used when there's a mistake in the inventory count and your products are more than what you have in your inventory.You are able to see your product's name, price, average cost, balance in inventory and the actual amount. You are only able to adjust the actual quantity of the item from the actual quantity column. NOTE: Inventory adjustment is NOT used for selling purposes. To sell , you must scan or enter the name of the product through the main dashboard. This module is only used to fix mistakes in the inventory such as having the same product count twice in your inventory and etc. Then, click on the inventory adjustment icon. 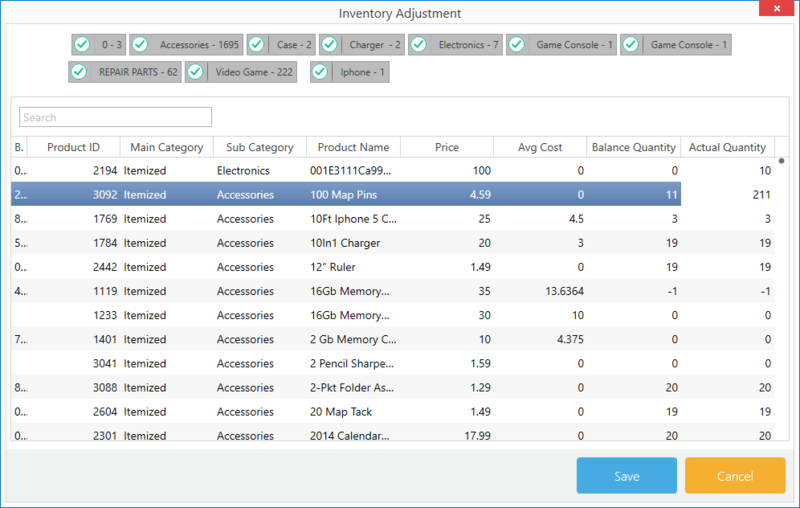 Once the Inventory adjustment window opens up enter the actual quantity of the products you have in your inventory in the actual quantity field. Once your done entering the actual amounts you may click save. And your inventory will be adjusted.